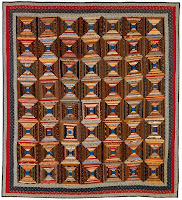 I, like many other quilting bloggers, received an email request from Eric Wolf, the Online Media Coordinator for Fons and Porter, to review their recent Log Cabin Book, given in a PDF format. I was not as prompt as I should have been in reviewing their book, so I am rectifying that lack of good manners now. 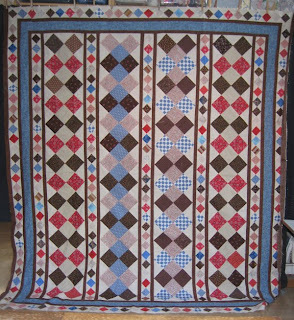 The Log Cabin layout was one of the very first quilts that I made (way back in 1978 or so). Over the years, I have made others, in variations of the basic layout. 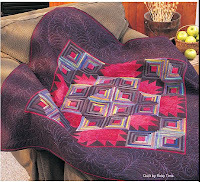 Log Cabin is a wonderful layout to make, for both the novice and experienced quilter. The Fons & Porter "Build Your Best Log Cabin" ebook presents an interesting collection of Log Cabin history, antique and modern photographs, traditional patterns and patterns for modern variations and technique tips. The basic patterns they provide are for the Traditional, Courthouse Steps and Chevron blocks. Using the Traditional block, they provide six different layouts, most of which experienced quilters will be familiar with. A strip cutting chart to create the Traditional block in five different sizes is provided. Then, for a contemporary twist on the Traditional block, a thoroughly delightful layout by Ricky Tims is provided. 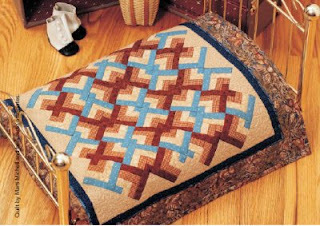 Ricky Tims' quilt pattern combines a Bear Paw block with the Traditional Log Cabin block for a unique look. Combining the Log Cabin block with a pieced block is sheer genius. Of course, Ricky's marvelous quilting in the wide borders sets the whole quilt off. I was pleased to see that a section of the book was devoted to the technique that Ricky used to do his quilting, which involves using specialty thread in the bobbin and quilting from the back. A second contemporary layout using the Traditional Block by Shon McMain was provided that presents the illusion of woven strips. It is a simply outstanding layout. Accompanying the layout are tips that make creating this quilt easier. 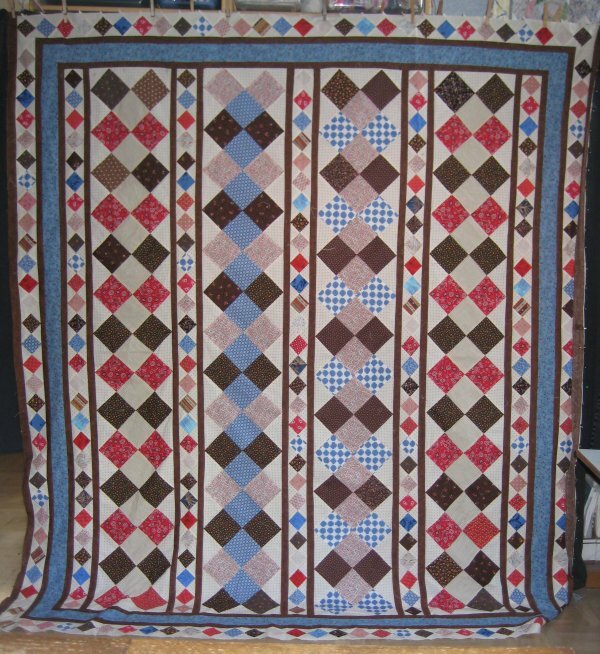 A pattern for a conventional quilt using the Courthouse Steps version of the Log Cabin block is given. You can make the blocks in 5 different sizes. A contemporary layout for the Courthouse Steps block is provided. Although it really, really, really is the Courthouse Steps layout, this version is simply framed squares. You might get a better handle on making these blocks if you think of them as framed squares rather than Courthouse Steps. The last version of the Log Cabin block is the Chevron. This is just a half Log Cabin, set on-point. Or, you could think of it as the center window of the Log Cabin being shoved into a corner and the rest of the block built around it. The sample layout shown is a scrappy version, which is probably historically accurate. I can see this version done in a monochromatic palette with the steps going from light to dark, which would result a modern twist. 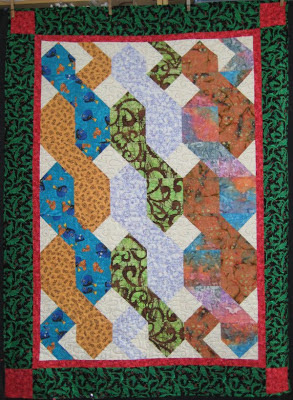 The alternative version for the Chevron block is provided by master quilter, Marti Michell, in a doll quilt size. Marti's layout gives the illusion of a chain link fence. At the end of the book, detailed directions are given for binding. One set of directions is how to include a strip of piping along with the binding for a shot of color. 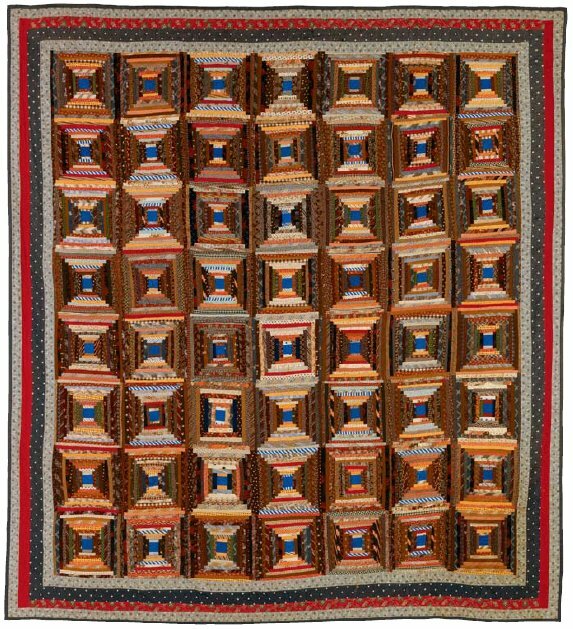 I've seen this technique used in real quilts and think it provides a subtle detail that might not initially register but subliminally you think, "wow ... that's an interesting quilt!". It's that small amount of color in the binding that does it. 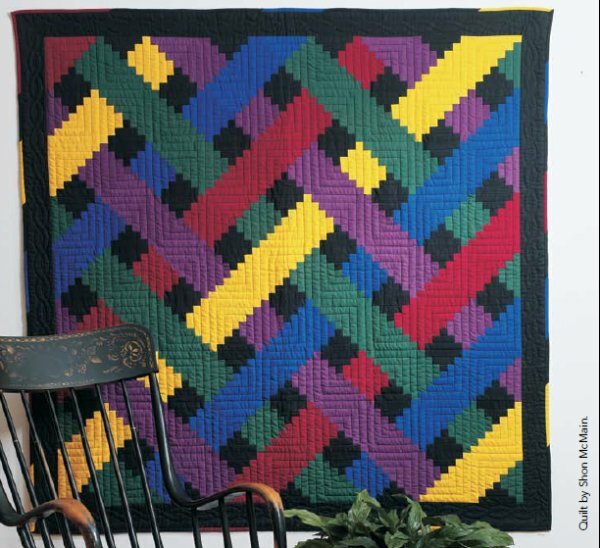 It's a detail that is definitely worth remembering for your next quilt. Unfortunately, I don't care for the directions that are presented in this book. They have you sew an actual piping strip, which makes the binding area very bulky and stiff. While I did *not* make a sample using their directions, I will assume that if you follow them, you will end up with a lovely piped binding. But it will be bulky. Instead, I prefer to use the 'faux piping' technique, which yields the same visual result without the bulk. There really isn't any reason to use actual *piping* alongside the binding when all you really want is the color spot. There have been several blogs that give you excellent tutorials on sewing the 'faux piping' ... just Google for them. The next section on binding is how to make that last seam .. the one that joins the two tails .. so it looks the same as all the other seams in the binding. If you have joined your binding strips in a diagonal seam, then these directions will show you how to make that last seam a diagonal one also. A diagonal seam distributes the bulk of the seam allowances over a distance so there is no ugly lump at that last seam. This is the preferred method to joining the tails. The theory is excellent; I use a diagonal seam for joining the tails myself. BUT ... the technique presented here is unnecessarily convoluted and complicated. A beginning quilter is going to be intimidated by all the picky little steps that need to be done; an experienced quilter is going to know there is a better, simpler method to achieve the same result. I do not recommend the book's technique for joining the tails of the binding. In conclusion, I can say that if you obtain this book for the patterns themselves, you won't be disappointed. While the directions for creating the Log Cabin blocks do not lead you by the nose in the assembly process, anyone with a modicum of common sense will be able to follow the graphic presentation of what strip to sew where and when. This book also assumes the quilter is not a rank beginner. It does not give you the basic "this is a 1/4" seam allowance" sort of direction. But once you've gone beyond being the "Beginning Quilter", anyone will be able to follow the directions given in this book. I truly enjoyed seeing the contemporary versions presented by Ricky Tims, Shon McMain and Marti Michell. It's always wonderful to see how others are able to think outside the box (or out of the Log Cabin, in this case!). As part of this review from me, I am able to provide you, my Dear Reader, with a link for you to download a free PDF version for yourself here. I always have a Forever Project ™ going. My Forever Projects are hand-work that I do when I am away from the sewing machine or quilting machine, such as on road trips, doctors appointment waiting rooms, Little League games, skating practice ... you get the idea. It gives me something constructive to do with my hands and eventually results in a finished project. The Forever Project that I *had* been working on (a hand-pieced, vertical diamond column top) was finished about 2 weeks ago. Therefore, I needed to start a new Forever Project. 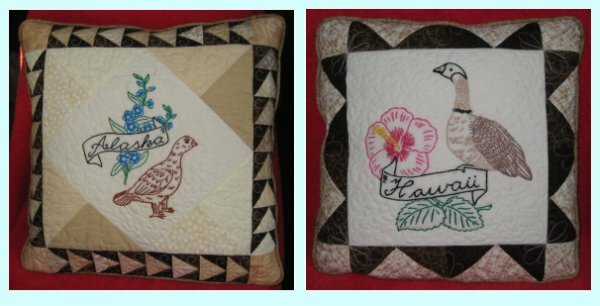 I chose Pacific Rim Quilting Company's "You are in our hearts", a Hawaiian applique wall-hanging (photo at left is from Pacific Rim Quilting Company's website). 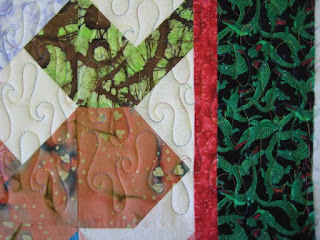 I just absolutely LOVE Nancy Lee Chong's method of needle-turn applique. I originally taught it to myself, using her "Peace" wall-hanging (scroll about half-way down that page). It was the first time that a needle-turn applique method "clicked" with me. The first time I made that wall-hanging, my oldest Dear Daughter expressed her liking for it, so I gave it to her. But that left ME bereft, so I eventually made a second one for myself. I also made "Grapes" (same page as "Peace" ... scroll about 2/3rds the way down the page), which is the project that is currently loaded on Lizzie for quilting. I had the FANTASTIC opportunity to take a hands-on applique lesson from Nancy Lee Chong herself, when a slot opened up in a guild's workshop. I am not a member of the guild, so I was very, very happy and grateful to have that opportunity. Nancy Lee Chong is simply a wonderful instructor. Very patient, very thorough, with lots of samples to show the students and ever-willing to show each student how to properly use her technique. I LOVE LOVE LOVE her technique because you don't have to use pins to hold down the applique! The raw edges are hand-basted down. You may think that this is a wasted effort but it is NOT. Once you have those edges basted down, your portable needle-turn project will never EVER stick you. :-) I *highly* recommend her patterns and if you ever have an opportunity to take a workshop or lesson from her, do not think twice about it; sign yourself up immediately! So ... back to my current Forever Project, "You are in our hearts". This pattern had been sitting in my To Do file for quite some time. From my stash, I found what looks like a hand-dyed batik for the applique and a mottled, neutral Fossil Fern for the base fabric. It took me one afternoon to do the preparation for the project and it was then folded up and put into my Forever Project tote box. The tote box has all the supplies necessary for the current Forever Project, whatever it is. The basic supplies remain the same: small, sharp scissors; pin cushion, needles, thread. Other supplies vary with the project. Well, today is "Support Your Local Quilt Store Day". I hadn't intended on making a run out there cuz Lord knows I have enough fabric stockpiled and I'm back to working on my List of 17 Unquilted tops. Which brings me to why I patronized my local quilt store: thread. I just don't have a whole LOT of quilting thread in various weights. The project that I'm going to be quilting next is called "Grapes", a needle-turn applique wall-hanging that I blogged about here. I've been studying this wall-hanging and .. oh hooray! ... have come up with a quilting plan! I'm glad this time it was fairly easy to decide what to do. BUT ... I didn't have the proper colors nor the proper weight thread, hence my trip to the local quilt store. My mission was successfully accomplished, I'm happy to say. The thread I picked up is Superior's "Bottom Line" in light green (#614) and deep purple (#631). They are going to be used for the stitch in the ditch around the appliques and for stitching the background designs. 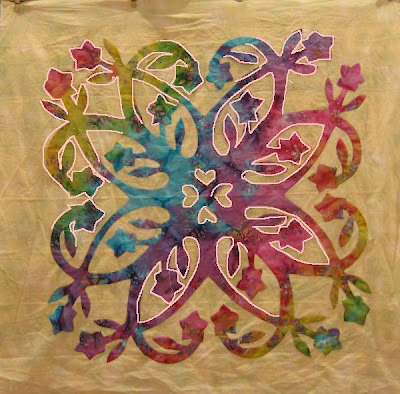 For this wall-hanging, I don't want the quilting per se to stand out. Since Bottom Line is so fine, it will work out wonderfully. I didn't buy Superior's "So Fine" line because it doesn't have the shades that I need. The one other thread that I'll be using for the wall-hanging is Fil-Tec's "Glide" thread. 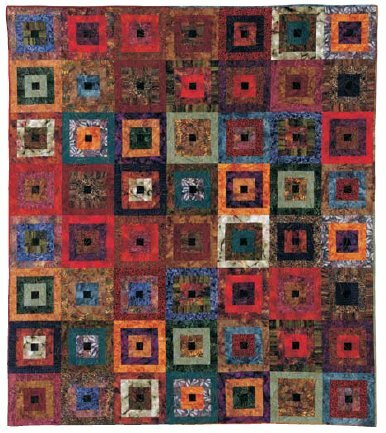 I've used this on a couple of other quilts and am simply in love with it. It's a trilobal polyester and literally slides through Lizzie .. no tension problems at all. I'll be using this thread for some accent quilting lines. So, that was my stimulation of the economy today. Next up: marking the wall-hanging so that I have some quilting guidelines. I can see, in my mind, so clearly how I want this wall-hanging to look like. I have every hope and anticipation that my vision will become a reality. At the end of the list! The last two webpages! I can hardly stand the excitement! I can't believe that I've actually finished the backlog of webpages! Although it's only been about 2 weeks, it seems as though it has been FOREVER that I've been working pages for my quilted things. 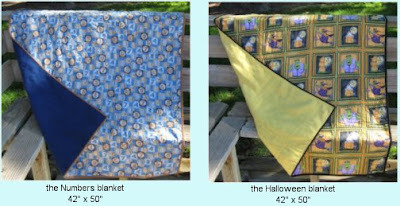 Last Autumn, I was commissioned to make two throw pillows to coordinate with a *hand-quilted* king-size quilt. No, I did not quilt the quilt; I don't do hand-quilting. (or at least, I do it under extreme duress). I made the two, an 18" knife-edge throw pillow, whose layout duplicates the blocks in the quilt, although the quilting I did on the pillow is different from that of the quilt. A second, 14" knife-edge pillow was made to compliment the bigger pillow and the quilt. 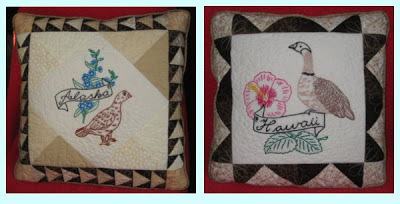 The focus of both pillows is the hand-embroidered center. That picture is just a teaser! For all the gory details, links and more pictures, please visit my web page for the two throw pillows. AND THEN ... drum roll, please!!! ... the last item on the list! The last backlogged webpage! Wooo hooo!!! This one is so simple, so easy that I'm glad I made them. 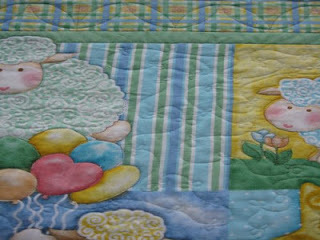 It reinforced to me that a very satisfying quilt does NOT need to be big nor fancy nor custom quilted. It can be as simple a single piece of yardage. For many reasons, this was one of the most satisfying quilts that I've made. I call them "whole cloth" quilts .... not because they are reminiscent of the incredible quilting in the whole cloth quilts that we normally think of .. but because they both were made of one whole piece of yardage. For two very special boys. That picture is just a teaser! 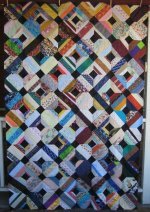 For all the gory details, links and more pictures, please visit my web page for the Whole Cloth quilt. 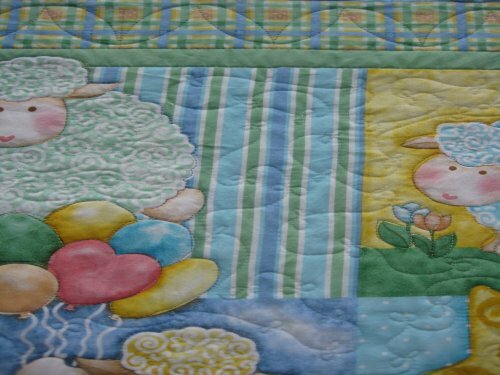 And now, with the publication of the last of the backlogged webpages, I can finally return to quilting! I can continue working from the List of 17 Tops to be Quilted. Yes, this is another backlog list. ::sigh:: I honestly look forward to the time where I can piece a quilt, quilt a quilt and publish a page. In that order. For every quilt. 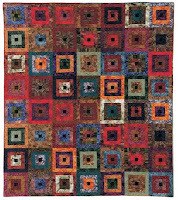 This is another scrap management quilt, similar to a God's Eye block. My notes say that it's called "Scrap Assassin" but research shows that it is NOT any of the quilt patterns currently going by that name. The hallmark of this block is that the center diagonal strip is always the same width, although the color varies from block to block. Capping each end of that center diagonal is a black triangle. The secondary pattern that emerges, when you sew the blocks together, is all those black triangles form a black diamond amidst the riot of color. That picture is just a teaser! For all the gory details, links and more pictures, please visit my web page for the Scrap Assassin quilt. How about a Friendship Braid? I used one of Darlene Epp's designs from her "Pocket Guide to Free-handing: Borders & Sashings" for the yellow sashing. A variation of a design I found "someplace" was used on the braid portion. Stitch in the ditch stabilizes *everything*. While the top was pieced in July 2012, the quilting waited until early January 2013. If you wander on over to the webpage, you'll find links to the Missouri Star Quilting Company video on making the half-hexie braid, to Darlene Epp's wonderful books and lots of pictures! Those pictures are just teasers! 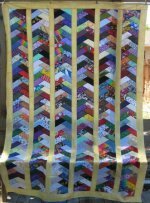 For all the gory details, links and more pictures, please visit my web page for the Friendship Braid: half-hexies quilt. A cousin of Mr. Pirate has a job with one of the hot air balloon companies that operate in the Napa Valley of California. Napa Valley is a premier wine grape growing area and hot air balloon companies have taken advantage of how picturesque it is. I was in the middle of working on another hot air balloon and grapes quilt when Mr. Pirate asked if I would make such a thing for this cousin. 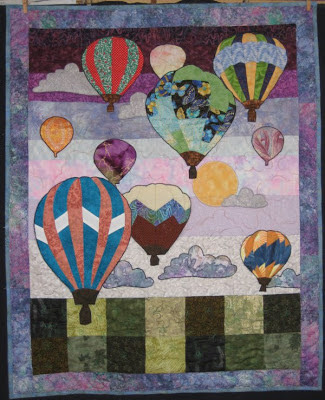 I agreed and found this pattern, "Evening Flight" by Barbara Jones. Evening Flight was a delightful project to do. Departing from my usual construction techniques, I fused the appliques and stitched a tight satin stitch over the raw edges. Quilting was minimal but appropriate. I even remembered to use one of my specialty templates to stitch a single rope cable in the border! Those pictures are just teasers! For all the gory details, links and more pictures, please visit my web page for the Evening Flight wall-hanging. Now before y'all start muttering to yourselves that it sure seems as though I am producing A LOT OF QUILTS these days, let me make this perfectly clear .... not true. I am making a lot of WEBPAGES these days! You see, all of the recently posted quilts (and the ones to come in the near future) were all pieced, quilted and bound *LAST YEAR*. 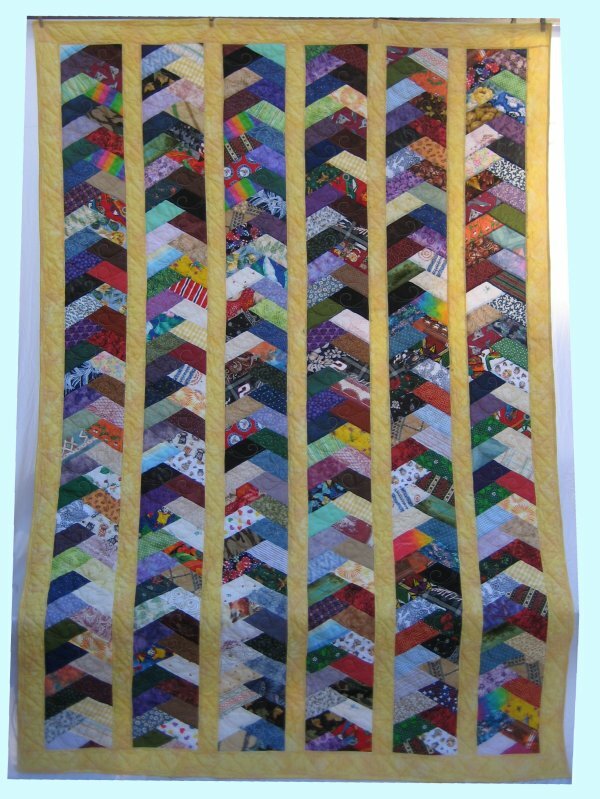 I just never made the accompanying webpage to share the quilt. One of Mr. Pirate's nieces was about to have her first baby. Well, kinda/sorta about to. It was March when I found out and June when the baby was born so instead of making a baby quilt to catch up with the baby, I was able to make the quilt ahead of time! Here we have 3 columns of intertwined snakes surrounded by a border of alligators. I used a pantograph called "Rain", designed by Lisa Calle. Those pictures are just teasers! For all the gory details, links and more pictures, please visit my web page for the Slithery Snakes quilt. During last year's (2011) Quilting Retreat in Phoenix, AZ, I found a pre-printed panel from Michael Miller. It was of an angel holding a lamb. It was simply spectacular. I knew that one of Mr. Pirate's cousins would love it *and* appreciate the work that would go into making something with it. I bordered the panel with Dupioni silk (*NEVER AGAIN*), put machine embroidered words (individually stitched letters put into Cathedral Window blocks) along the right side and along the bottom. 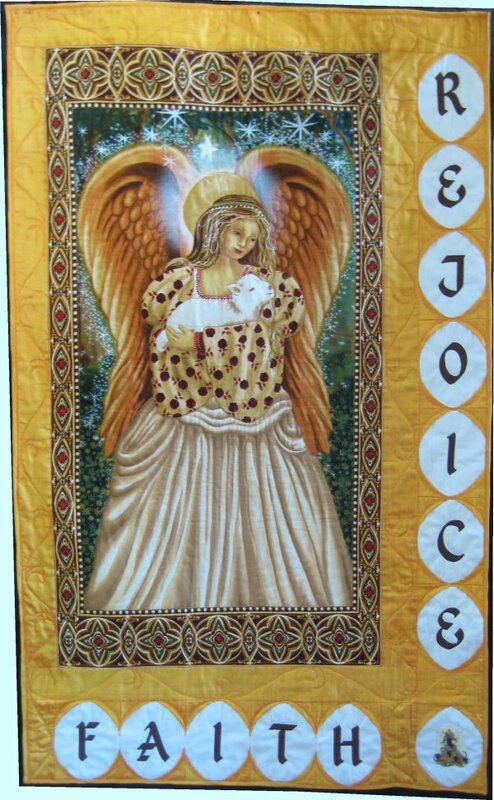 In the bottom right corner, I put an embroidered angel by Sonia Showalter. Even with the problems I had with longarm quilting the Dupioni silk (*NEVER AGAIN*! ), I think it came out very nicely. Those pictures are just teasers! 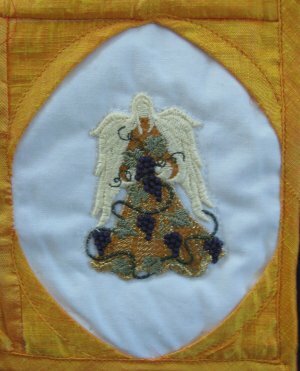 For all the gory details, links and more pictures, please visit my web page for the Golden Angel wall-hanging. Mr. Pirate gets guy-stuff catalogs in the mail, touting all the latest "manly" stuff. One item that caught his eye was a battery powered rotisserie (that's two out of the three attractions). You might ask, "why on EARTH would he be interested in such a thing?????" But, I tell you, there IS a reasonable rationale! When I was growing up with my parents and siblings, that's what WE did for vacations. Mr. Pirate was slightly more rustic, in that he went back-packing. I gave back-packing the old college try when dating Mr. Pirate but I'm a wuss ... it just wasn't my cup of tea. But I love camping. So, Mr. Pirate is always on the lookout for camping gear. Sometimes weird camping gear. Some of the items he buys are experimental and don't work out as envisioned. 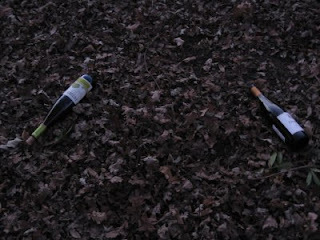 Some have become part of our standard camping equipment. You see, as we are tent camping, we don't have electricity. This cuts down our options on cooking quite a bit. Mainly we do stovetop cooking and Dutch oven cooking. Typically speaking, we have a large group when we camp ... sometimes between 15-20 people. This also cuts down our options for cooking, as grilled steaks for 20 just doesn't cut it. In recent years, the group has decreased to 8-12 people but still ... that's a lot of people to cook for out of doors! We have some tried and true dishes that have become standards at camping, simply because they feed a lot of people without a lot of work and it's easy clean up. Back to the guy-stuff catalog ... Mr. Pirate saw this battery powered rotisserie. It was intriguing. We could potentially do a rotisserie roast for *everyone*, no muss/no fuss, and what a great change of pace for dinner! This afternoon/evening we (Mr. Pirate & I) decided to try out the new battery rotisserie. A 3 lb roast was obtained, seasoned and skewered onto the rotisserie. Originally, Mr. Pirate thought he would use coals from the wood fire to cook the roast, but being unsure of how long this might be, he changed his mind and opted to use charcoal briquettes instead. 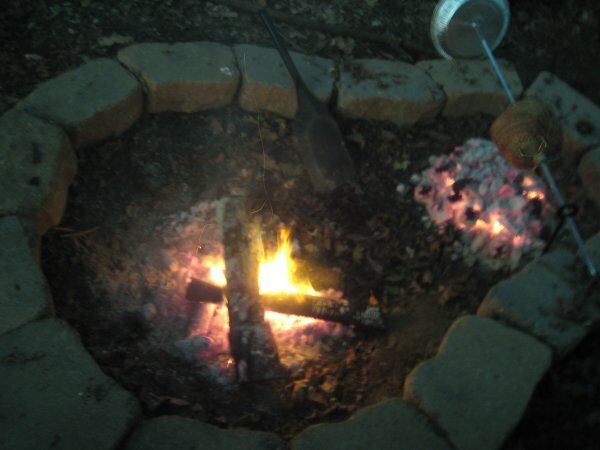 Last summer, Mr. Pirate built us a keyhole firepit in our backyard. 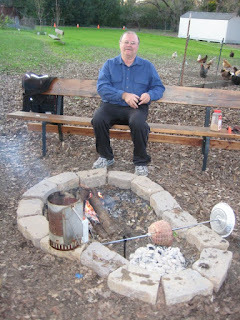 For this rotisserie experiment, he built a wood fire in the firepit (so we could keep warm in the chilly January late afternoon) and a charcoal fire in the keyhole portion. As the wood fire burned down and produced some wonderful coals, we moved those wood coals to the charcoal briquette pile to help cook the roast. As we waited the hour-and-20-minutes for the roast to cook, we enjoyed some wine that was leftover from a previous party. During the waiting time, I used the opportunity to collect the daily eggs from our stupid chickens. Boy, we had a bumper crop today! 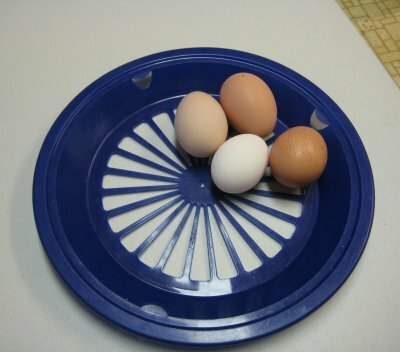 Four eggs! woo hoo! 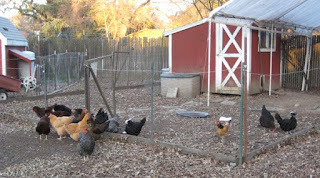 and these chickens (plus one rooster who doesn't lay eggs at all) produced those four eggs. During the summer, they'll lay between 8-10 eggs a day but now, during winter, when there's less daylight, they just don't sit down on the job, as they should. I keep waving a rubber chicken in front of them, with the caution that "this could be YOU" but they, like the cats, just ignore me. In November 2010 (yes, over 2 years ago), I pieced a top. 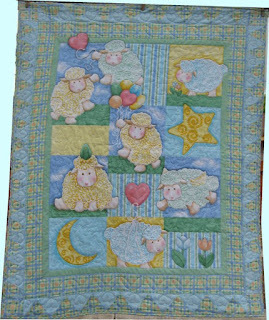 In May 2011, I quilted it for a new baby in the family. Due to my extreme talent in procrastination, the webpage for this quilt wasn't made until *just this very minute*! I'm almost (but not quite) embarrassed at how easy this quilt was to make. Granted, it started with a pre-printed panel (that's not heretical, is it?) but I did add on a wonderful pieced dogtooth border that fit exactly. Boy, was I proud of myself with that! I used Darlene Epp's Pocket Guide to Freehanding (wonderful, wonderful series of books; highly recommended) for the background embellished meander. I did some nifty little swirly things in the lambs' fleece. 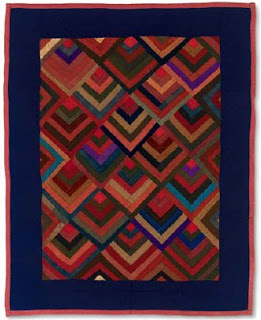 I SITD all the big motifs of the panel and quilted some (almost) good looking hearts in the dogtooth border. Free-motion hearts that look symmetrical and great require great talent and skill .. neither of which I possess. (I also didn't want to devote *that much time* to use a template. Those pictures are just teasers! For all the gory details, links and more pictures, please visit my web page for Madeline's Lamb quilt. Even though it's a small project, I quilted it on Lizzie. 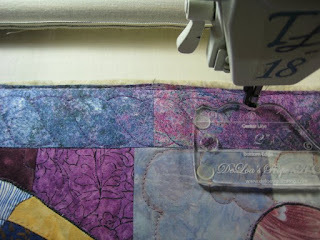 It was just easier for me to do so than quilting it on my Janome 6500. The table runner as been in use since then but it's only *now* that I've gotten around to making a web page. Now, this is more like me! Procrastinators unite! That picture is just a teaser! For all the gory details, links and more pictures, please visit my web page for the Apple Core table runner quilt. I have a list of projects. This list has 5 sections: Tops to be Quilted; UFOs & kits; Ideas/Designs for which I've pulled fabrics; Ideas/Designs only - no fabric; Coordinated bundled fabrics with no specific idea in mind. I've been working off the first section for a Real Long Time. Currently, it has 17 entries. It's turned out to be a revolving door: no sooner do I finished one project in that category then another gets listed to fill in the vacancy! The newly listed project isn't necessarily one from the other categories either! However, it is with some significant sense of accomplishment that I can say since this past December, I have quilted *five* of those projects, which means I have twelve projects still be quilted. Some of those projects I've already talked about: Gone with the Wind, String of Pots and Woven Ribbon Trees. Since the first of the year, I've finished the quilting and binding of two more projects: both vaguely twin sized quilts. Scrap Assassin is about 60"x90" and the Half-hexie Friendship Braid is about 66"x94". All of those 5 quilts were done on my longarm machine, which means that when I was quilting on them, I wasn't in my sewing room doing any piecing. This causes some inner angst in me since Mr. Pirate likes to sit in my sewing room (where I have a decent sized TV) in the evening and spend some time watching TV. I would like to spend time in his company but if I'm working on the longarm, that isn't possible. If I do adjourn to the sewing room, I'm not working on the longarm. Additionally, if I'm in my sewing room, I like to be working on a project and not just sit there like a bump on a log! BUT, I do NOT want to start another machine piecing project! That will just create Another Top, which would join the pile! 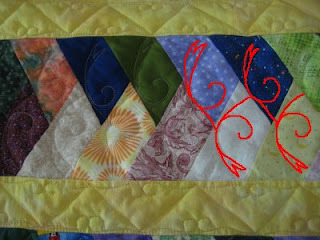 My intent is to whittle that list of Tops to be Quilted down to nothing .. then: piece a top/quilt a top. So, at this time, machine piecing a project is not on the horizon. My current Forever Project is using up even MORE vintage calico squares that I had rediscovered during a re-organization of my sewing room. I've already made FOUR quilts from these squares and had thought I had finally used them up. I was wrong. Gosh, I am SO tired of looking at this color palette! This Forever Project is currently at 83"x93" and will get slightly larger, as I still need to put on the top/bottom narrow borders then a final, wider blue border. Yep, it's entirely hand-pieced. 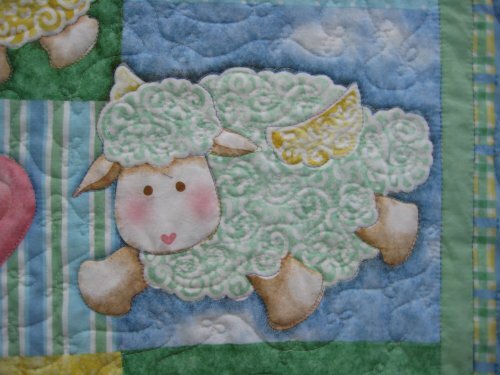 I've tentatively worked out a barter with a local sewing buddy who likes to hand quilt. She doesn't particularly care for piecing and will happily hand quilt cheater tops just so she can get to the quilting part! 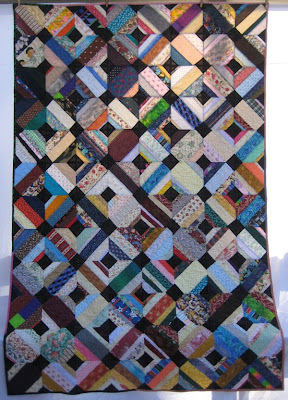 I, on the other hand, deeply admire and appreciate hand quilting but am not in the least bit interested in doing any more of that! So the barter may work out to be that she will hand quilt my Forever Project (in whatever manner she feels is appropriate and is willing to do) and in return, I will piece a top for her (of whatever size and pattern she would like), so that when the machine pieced top is finished, she can get right to the quilting part! Anyway, I was finishing up the half-hexie Friendship Braid quilt on my longarm and thought about the webpage that needed to be created for it. You see, for myself, part of the project is not only sewing and quilting but also making a webpage for the project so it can be shared. It is a sad fact of life that some activities simply can NOT be multi-tasked! If I'm longarming, I can't be piecing on my sewing machine. If I am piecing, I can't be working on the computer for a webpage. All of those activities are mutually exclusive. As I thought of what I'd put on the webpage for the latest quilt, I also was simultaneously thinking of the OTHER quilts for which I needed to make a web page. I was becoming discouraged as I thought of more completed projects without their webpages. Finally, so I wouldn't lose track of them, I wrote them down. Or .. I could simply ignore the entire quilting enterprise all together and do some housework. The current status of that category is seventeen, yes, count 'em, *17* tops to be quilted. Oy vey! What's even worse, I know I have two king sized tops in there, maybe three. That's a LOT of real estate to quilt. BUT ... I need to get those tops quilted! So ... that's where I am right now. Back in 2004, I started a layout called "Scrap Assassin" as part of a quilting demonstration. When the demo was over, I packed the blocks away. It wasn't until summer of 2012 that I finished all the blocks and assembled them into a top (roughly 60"x90"). Because this top is just SO. VERY. BUSY ... I decided that I'd do a pantograph. I chose "Espalier" by Hermoine Age. I'm using Glide thread by Fil-Tec. This color is called "Khaki" but it really looks like an "old gold" shade. Lovely, lovely stuff. The panto is looking good and I just LOVE the way Glide thread stitches! The only annoyance (for me) is that I don't particularly care for doing pantos. I don't like not being able to see what I'm stitching. This is ESPECIALLY annoying when the bobbin thread runs out and I don't notice it until much later. This particular top has a LOT of intersections. Unfortunately, I made an unwise choice in the black fabric ... it's especially thick for some reason. Lizzie doesn't exactly "balk" at the intersections but she does protest a little by doing a little dance around the thick areas. I can feel it when I'm guiding the machine head and I'm not always certain if it's a thick intersection or if something is really going wrong with Lizzie. Thankfully, it's always been a thick intersection (so far!). Since I can't see where I'm stitching, I can't compensate the quilting design in those areas, so they look a little weird. So, why am I doing a panto when I don't really care to do them? Well, basically, just to keep my skills current. Being able to quilt with a pantograph is useful and I don't want to forget the specifics. It'll never be my favorite style of quilting but some quilts don't need custom, semi-custom, or even specific quilting in different areas. For some quilts, pantographs are just the best way to go and I want to be able to do it.